Today Ravel posted the complete digitized court opinions of Massachusetts and Delaware, adding to the New York and California cases already posted. This means that, for the first time ever, the full collections of these states’ cases are now available online and available to anyone for free. Ravel plans to have all the states digitized and online by early in 2017. Ravel has also started digitizing early federal case law from the 1800s and early 1900s and will be posting that online as well, Lewis said. 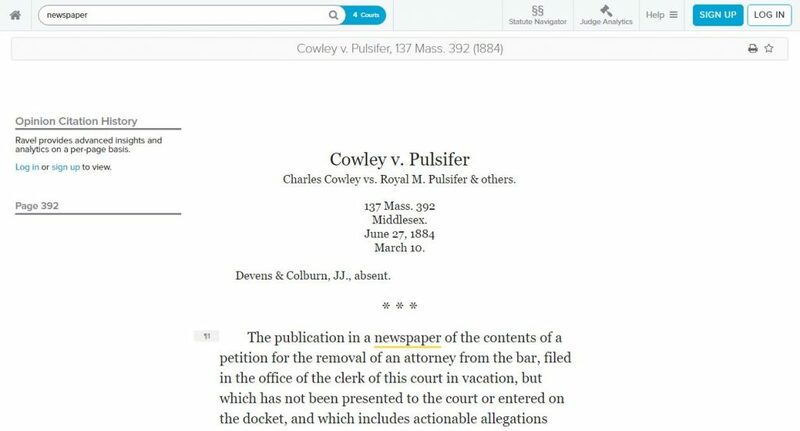 As Ravel adds new cases, it also incorporates them into other parts of its legal-research platform, including its Judge Analytics feature, which allows subscribers to explore analytics showing how judges make decisions. Access to the Harvard cases through Ravel is free to anyone. Ravel charges a subscription for access to its advanced features such as analytics. Harvard and Ravel call their joint project the “Free the Law” initiative. While Harvard is providing the cases, Ravel is providing millions of dollars to support the scanning project.